The Dragons are heating up! We have already had many student activities, including the start of 7 clubs, plus parent-teacher conferences and parent workshops. Prom and senior graduation is around the corner. Half of our high school students are "Dragon Green,” which means they have 98% attendance or higher, all A’s and B’s, and are taking a leadership role in the school. This is impressive since our students enroll in rigorous classes like Dual Credit Calculus, Advanced Placement (AP) U.S. History, and 9 Honors courses. Cruz students also participate in an arts program, selecting either music, theater, dance, or visual art as a freshman, then taking that class for 4 years, including a weekly studio rehearsal. Cruz students will all have the opportunity to apply to 4-year colleges and scholarships, and dedicated students will have the skills needed in their chosen art to apply to those programs as well. 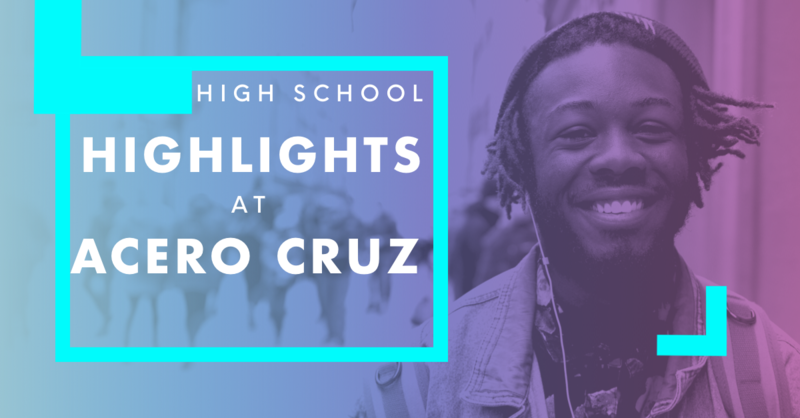 In these ways and more, Acero Cruz is excited to connect students and families in the daily life of the school. We believe all students have the ability to shape their own lives and society in positive ways. One of our goals is to have students recognize their own power and use that power to improve themselves and their communities.